Thousands have taken to the streets across the US to defend workers’ rights, and protest against the treatment of immigrants and despised presidential campaign rhetoric. 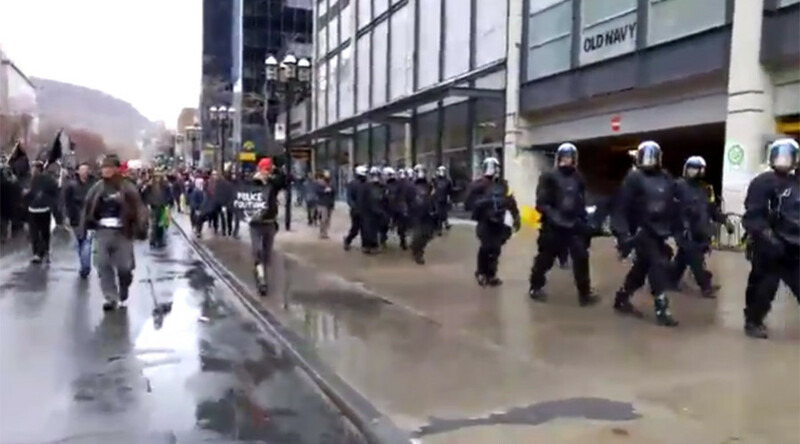 Arrests were made in Montreal and Seattle, where May Day celebrations resulted in clashes with police. Canada May Day celebrations ended up with crowds scuffling with the police just one hour into the demonstration. Rallying to fight “imperialism, racism, borders and colonialism in an attempt to destroy capitalism,” the so-called anti-capitalist protest got a bit out of hand. As the procession went into full swing, some protesters attacked police station on Saint Catherine Street. Two large police station windows were smashed by projectiles. Police was forced to use canisters of tear gas to disperse the crowd. Orange smoke filled the area around Bishop and St. Catherine streets. Police reported at 10 arrests and one minor injury, according to the Canadian press. Over in the US, clashes happened in Seattle, where police used flash grenades and tear gas against protesters, who threw petrol bombs and rocks at them. Five officers were injured as they were arresting nine anti-capitalist demonstrators. Saying no to immigrant deportation, detention and raids, they began their May Day rally on Union Square in Manhattan at noon. Arguing that “black lives matter”, the activists spoke out against police brutality. They also called on workers to have sustainable wages. Surrounded by a police presence, they walked across the Big Apple in their hundreds. The anti-Trump sentiment was extremely strong over on the West Coast in Los Angeles, where hundreds of neutralized immigrants also gathered at noon for a May Day rally. Three separate marches began peacefully around noon, with several hundred people in attendance.